Love gardening, but live in a small, cramped apartment? No problem. We've rounded up six creative ways you can showcase plants even if you have no space - by hanging them from walls, ceilings, and windowsills. 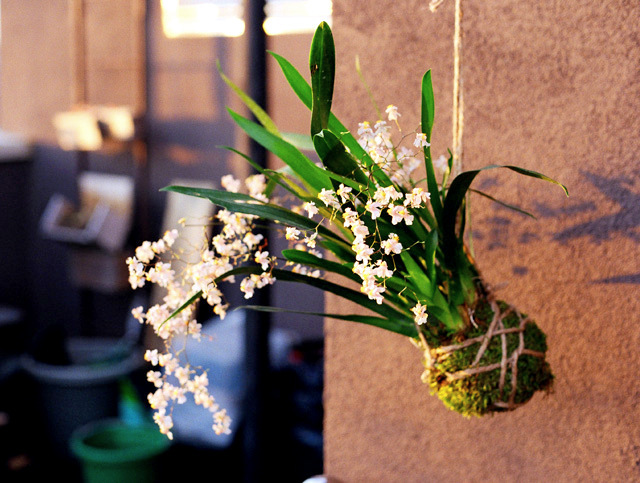 Check out these fun, DIY indoor hanging garden ideas, and create your own green oasis. 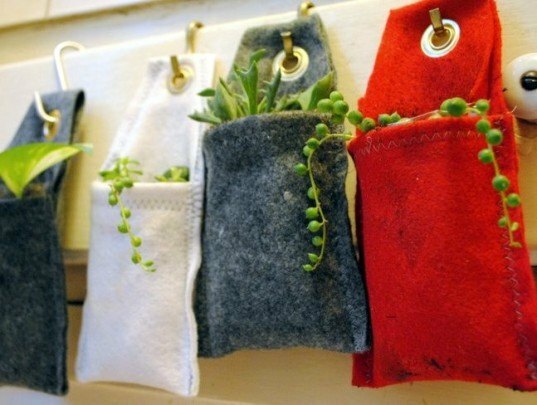 Whip up these adorable mini plant pockets made from felt by following our simple DIY instructions. Since the pockets can be attached to a hook, tack, or nail, you can hang a little patch of greenery almost anywhere – a window, an office cubicle, your bathroom. Or give them as gifts. Ever dream of snipping fresh herbs to cook with right in your own kitchen? Well, if you’re lucky enough to have good sunlight, you can. Follow along with Inhabitat’s fun video tutorial to learn how to make this modern wooden rack to hold planters made from upcycled glass jars. Terrariums are a classic creation for the indoor green thumb. You can create your own tiny green world in any glass vessel, including jars, fishbowls, bottles, or dishes. What’s more, you can riff on the classic mossy terrarium and create one with air plants or succulents if you happen to live somewhere that’s a bit dry. Check out our DIY for instructions. See our our tutorial on how to create an easy, knotted plant holder from string, yarn, or rope. A modern variation on those funky macrame plant holders of yesteryear, this string holder can be sized to hold anything from a jar to a full-sized plant pot (just make sure your mounting bolt is securely fastened). You could even make a tiny terrarium and then suspend it with a string plant holder. Kokedama are amazing decorative plant objects originating in Japan, consisting of a moss ball wrapped around a plant that’s then suspended from string or placed in a dish. Follow our fun tutorial here to find out how you can create your own hanging forest of kokedama at home. Even if you drink out of a reusable water bottle, chances are you still end up with a few plastic bottles in your recycling. Check out our DIY instructions for turning trash into a unique growing environment for house plants. In winter, this plastic bottle planter could ideally be placed in a sunny window to keep your gardening urges at bay until springtime. Mini Felt Planters Whip up these adorable mini plant pockets made from felt by following our simple DIY instructions. Since the pockets can be attached to a hook, tack, or nail, you can hang a little patch of greenery almost anywhere - a window, an office cubicle, your bathroom. Or give them as gifts. 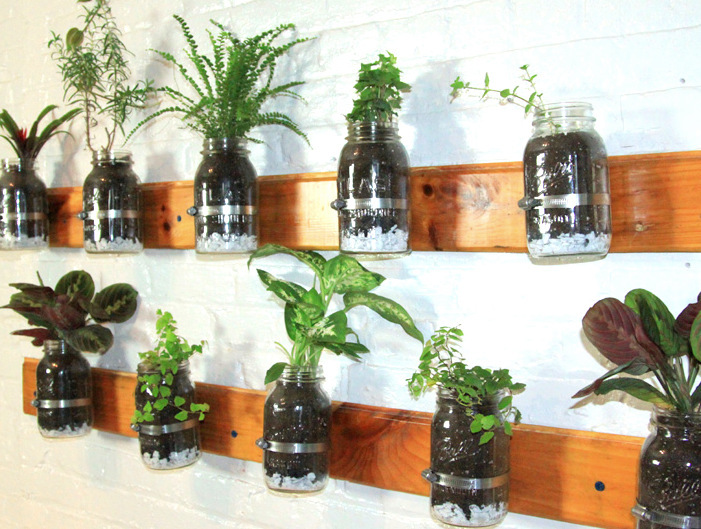 Mason Jar Wall Garden Ever dream of snipping fresh herbs to cook with right in your own kitchen? Well, if you're lucky enough to have good sunlight, you can. Follow along with Inhabitat's fun video tutorial to learn how to make this modern wooden rack to hold planters made from upcycled glass jars. DIY Glass Terrarium Terrariums are a classic creation for the indoor green thumb. You can create your own tiny green world in any glass vessel, including jars, fishbowls, bottles, or dishes. 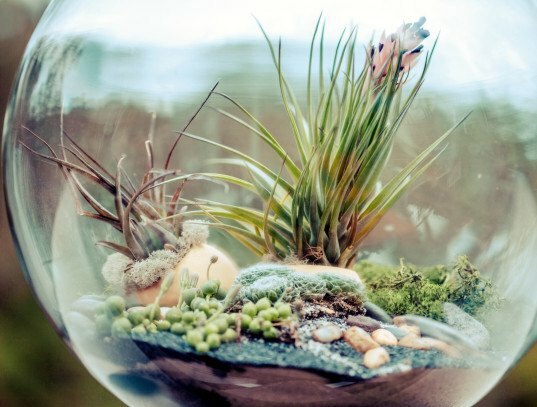 What's more, you can riff on the classic mossy terrarium and create one with air plants or succulents if you happen to live somewhere that's a bit dry. Check out our DIY for instructions. DIY Knotted String Plant Holder See our our tutorial on how to create an easy, knotted plant holder from string, yarn, or rope. A modern variation on those funky macrame plant holders of yesteryear, this string holder can be sized to hold anything from a jar to a full-sized plant pot (just make sure your mounting bolt is securely fastened). 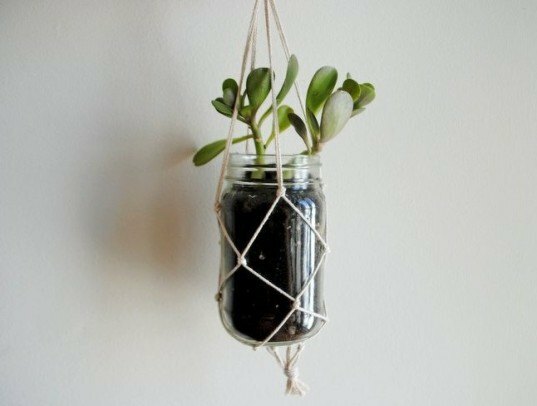 You could even make a tiny terrarium and then suspend it with a string plant holder. Hanging Kokedama Kokedama are amazing decorative plant objects originating in Japan, consisting of a moss ball wrapped around a plant that's then suspended from string or placed in a dish. Follow our fun tutorial here to find out how you can create your own hanging forest of kokedama at home. Upcycled Hanging Plastic Bottle Planter Even if you drink out of a reusable water bottle, chances are you still end up with a few plastic bottles in your recycling. 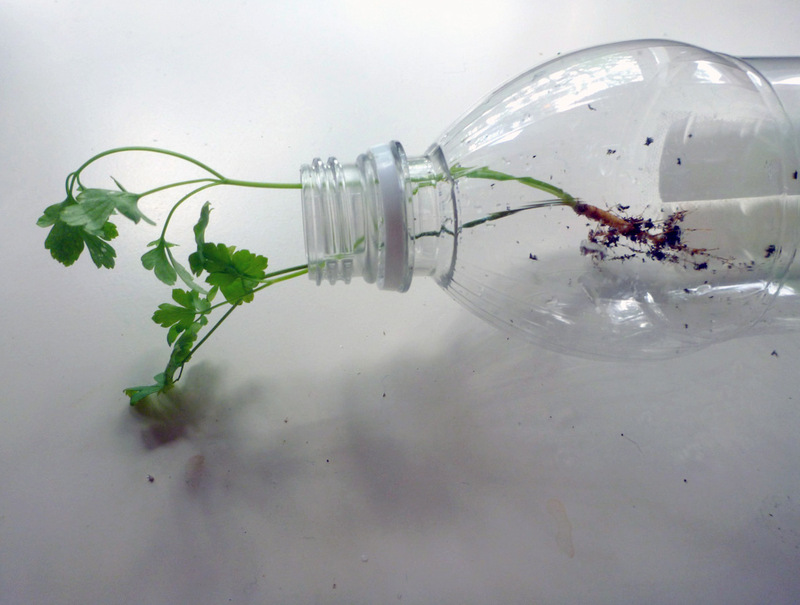 Check out our DIY instructions for turning trash into a unique growing environment for house plants. In winter, this plastic bottle planter could ideally be placed in a sunny window to keep your gardening urges at bay until springtime.